The key to achieving Cranio Dental and Skeletal Symmetry™ and full body health. Every patient has a right to get relief from their chronic illness. The present success rate that medicine achieves for many of the above listed illnesses is close to ZERO. Every dentist should be allowed to treat patients suffering from illnesses or symptoms listed above after appropriate training. Dental regulatory authorities and the board appointees individually, (as happened in a recent USA case) should be penalised for denying or hounding dentists delivering such treatment. "Dental regulatory authorities have gained tremendous power over dentists’ ability to practice dentistry, and while standards are needed to protect patients, dental regulatory authorities frequently misuse that power. License revocation, needless harrassement, and other career-ending punishments are being used to stifle free speech, free thinking and the open-minded investigation that should be a cornerstone of science itself." How do the jaws and cranium relate to the rest of the body? The cranium is the main part of the skull, made up of some 27 different bones. The places where these bones join are called sutures. Attached to the cranium is the facial skeleton, including the TMJ (temporal mandibular joint), which is located at the point where the lower jaw meets the temporal bone, just in front of the ear. Distortions of this joint because of dental abnormalities and various interferences often lead to what is known as TMJ disorder or Temporo Mandibular Joint Dysfunction. Experience has shown that this disorder is responsible for perhaps some 80 different medical conditions. Please see our blog for very many topics on all kinds of illnesses emanating from the asymmetry of the jaw joint. Our head is very finely balanced on our neck vertebrae. The first vertebra to accept this weight is called the ATLAS. The symmetry of this vertebrae appears not only to get affected by dental abnormalities but the Atlas may have inherent asymmetries of its own through trauma or mishaps during the birth process. Its asymmetry affects the Hypoglossal nerve which emanates from the skull just above this vertebra. The hypoglossal nerve supplies motor function to the tongue which is instrumental for the swallowing reflex. Any disturbance to the fibres of the hypoglossal nerve through the asymmetry of the Atlas and in turn the asymmetry of the occipital condyles which house the canal for the Hypoglossal nerve would obviously affect the swallowing pattern which in turn would cause the dental arches to not develop optimally. This would tend to cause all kinds of malocclusions and jaw size discrepancies. No wonder children are often unwell right from the start. Any asymmetries in the teeth and jaws affect not only the Atlas but also the rest of the neck vertebrae causing them to compensate by rotation and deviation which would lead to neck and shoulder pain. Distortions in the neck region are compensated by opposite distortions in the lower spine and a rotation of the hip bones which produces the short leg phenomenon as often pointed out by Osteopaths and Chiropractors. 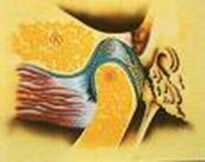 Pain anywhere along the line is often the consequence because the the nerves emanating from the spine get affected. Disturbances in the jaw region cause postural problems. A small jaw causes the head to stoop forward and the rest of the spine compensates accordingly by increases cervical and lower back curvatures. 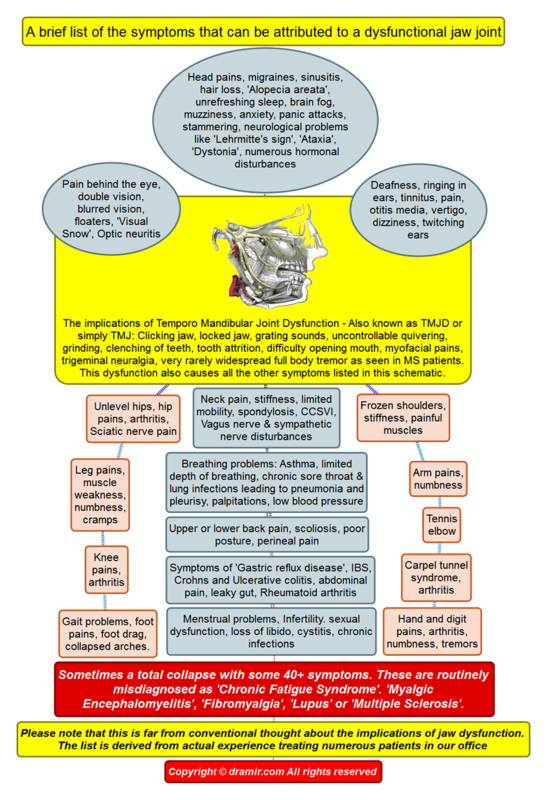 The TMJ is unique in the body in that it is often subject to external stresses from human intervention, especially through the application of injudicious dental treatment. For example, dental crowns may alter the lower jaw's natural resting position, putting strain on the TM joint. In addition, traditional orthodontic practice – where healthy teeth are often removed unnecessarily – can radically alter the overall shape and natural position of the jaws. The extraction of wisdom teeth can also seriously harm the harmony of the face and lead to very serious ill health. Additional stresses that can also affect the overall balance of the jaws and cranial bones including trauma to the neck and cranial region such as whiplash injuries and birth trauma. Why is cranial and skeletal symmetry so important? The brain and spinal cord together form the central nervous system, which acts as a central computer, receiving and processing vital information from the rest of the body. The spinal column also carries nerves that form part of the autonomic nervous system - the sympathetic chain, which has numerous branches throughout the body, carrying essential nerve impulses to organs such as the skin, digestive system, heart, lungs and reproductive organs. Roger Sperry who won the Nobel Prize for brain research in 1981 states that: "More than 90% of the energy output of the brain is used in relating to the physical body in its gravitational field. The more mechanically distorted a person is the less energy available for thinking, metabolism and healing." I often use the term "hanging by the skin of your teeth" It appears that the difference in health and sickness is the thickness of a piece of paper. This we have experienced repeatedly and very minute changes can take a person into sickness or health. 60% of the sensory input to the brain is from the Trigeminal nerve which supplies the head, jaws and teeth. Any problem in this region floods the brain with messages saying that 'there is something wrong'. The brain responds by firing impulses to various muscles around the jaws to correct the asymmetries but in the presence of any asymmetric hard bony and tooth structures it fails to correct the asymmetries. Grinding teeth at night is one indication that treatment to correct the jaws is required. Another important effect of an asymmetric jaw is the effect on the nerve supply to the diaphragm – impaired function of this muscle can lessen optimum breathing capacity, with a knock-on effect on numerous bodily processes. The brain and spinal cord are also surrounded by a clear liquid called the cerebro spinal fluid (CSF), that protects and cushions the nervous tissue, and assists in carrying toxins away from the brain. Obstruction or distortions to these systems, such as that caused by spinal, cranial or jaw misalignment together with poor diaphragmatic function, can affect the flow of cerebro spinal fluid (CSF) to the brain. Any imbalance in the jaw or cranial region can therefore have a major effect on the rest of the body, causing a whole range of symptoms, which modern medicine is often unable to explain or treat effectively. Drugs are rarely the answer and yet millions of prescriptions are written out everyday at resolving pain and other functional disturbances to the body. These are futile attempts as physical disturbances need physical treatment. The drugs mask the underlying symptoms which continue to worsen by the day leading to conglomerations of symptoms such as found in Chronic Fatigue Syndrome making the patients almost untreatable in advanced stages. The doctors keep running in circles trying to do all kinds of futile tests as many must have experienced and then naming illnesses by a process of exclusion into various syndromes. Cranio-dental & Skeletal Symmetry™ seeks to bring balance to the body, and thus dramatically improve unresolved illnesses and symptoms, by adjusting the teeth and jaws using orthodontic treatment. The teeth are the anchor where forces can be applied to bring about jaw joint and body symmetry. Traditionally, dental patients are often told they have 'too many' teeth for the size of their mouths, and that extractions are necessary to ease 'crowding' – when in fact, the jaw should be expanded to accommodate all of the teeth – think about it, why would nature give us too many teeth when the rest of you may be a picture of perfection?! The average size of the jaws of Western man has decreased over recent centuries, most likely due to radical changes in diet and possibly also as a side effect of widespread pollution. Rather than making the jaws even smaller by extracting teeth, it is far better to expand them, preserving all of the healthy teeth, and bringing the entire craniofacial structure into balance. Where teeth have already been extracted, or other dental treatments undertaken, it becomes vital that the jaw is restored to its natural shape and position in order to bring about significant health changes. Which illnesses and symptoms may benefit from this approach? An initial appointment will consist of a full analysis and evaluation of symptoms, along with a comprehensive oral examination, and note of medical and dental history. The patients have to complete an extensive online questionnaire before the appointment. Dental models and (low radiation) X-rays will be taken, and the proposed treatment plan will be discussed with the patient. Our bodies respond extremely rapidly to the correct treatment. Patients usually notice some benefit within a few weeks of starting treatment, often within hours of fitting the first appliance. Particular care is taken of nervous or apprehensive patients, and appliances are adjusted to be comfortable and cosmetically unobtrusive. Osteopaths, chiropractic and other practitioners often refer their difficult-to-treat patients, and along with the numerous health benefits, many patients find a pleasing improvement to facial profile, as the jaw and cranium are brought into natural alignment. Cranio-dental & Skeletal Symmetry™ aims to restore balance to bodily systems, bringing about a permanent and lifelong improvement in health and well-being. Register to complete our unique online 8 page comprehensive Questionnaire (Cost £29.00 redeemable from the consultation fee of £120.00). Please complete the online questionnaire before your appointment date.